You are here: Home / Tours and Live Performances / 2013 "Non-Tour" Tour / Celebrate Adam Lambert Day, Win a Trip to the GLAAD Awards, Adam on American Idol Finale; Catching Up With Adam Lambert! May 8: How are you spending today, May 8? It’s Adam Lambert Day, not just for San Diego – it’s for ALL of GlambertLand! This has been the BEST four years, hasn’t it? And it’s not slowing down. Take that all you haters! I know many of you share my same feelings. Thanks to this wonderful man, all of our lives have gotten new breath. We’ve made incredible friendships and they are proving to be our best friends ever. Our fellow Glamberts understand us best and share our passions, they never question us, and they’re right next to us for all our crazy adventures. I am so thankful for you all! May 11: Adam Lambert will be receiving the Davidson/Valentini Award at the 24th annual GLAAD Media Awards in San Francisco at the Hilton San Francisco, Union Square. The event starts at 5:30pm PT. Adam is also nominated for Outstanding Music Artist, Trespassing. Tickets are still available for purchase or even better, enter to win! May 16: American Idol Finale??? I took this from Adam’s “official” site. I use the quotes because if it’s Adam’s official site, why do they take their information from The Hollywood Reporter? According to The Hollywood Reporter, it has been confirmed that Adam will indeed perform on the finale of American Idol, which has an air date of May 16. Unless he performs more than once, he won’t be performing a solo, but rather in a duet with Top 3 contestant Angie Miller. However, if they stick with the usual format of the finale, Adam and Angie will be singing one of Adam’s songs! Who’s going to be at American Idol? Let us know! June 29: Universal Studios, Orlando, Florida – Adam will be performing in the Summer Concert Series. The concert is included with your park ticket or you can purchase a special ticket for admission at 7 PM for the concert. 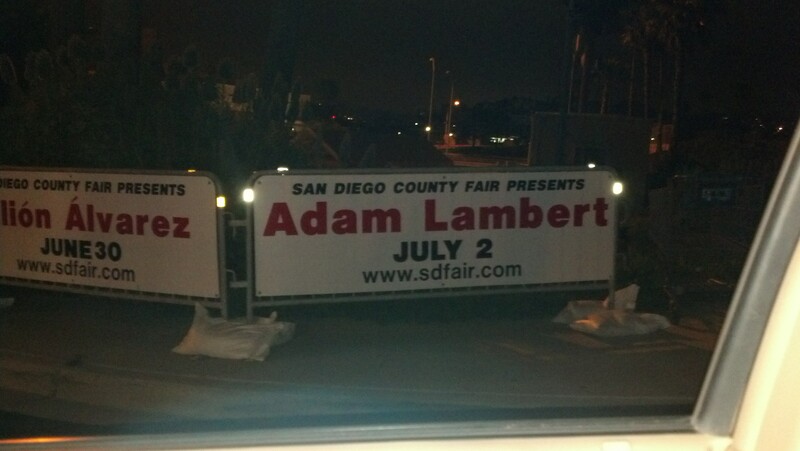 July 2: San Diego County Fair – Which brings us to the concert so many of us will be at without the humidity of Florida! Adam will be lighting the San Diego skies on fire on July 2 when he headlines the Toyota Summer Concert Series at the San Diego County Fair. A few good seats in the reserved sections are still available as well as the General Admission sections. I’ve been sitting in the unreserved GA section for 15 years and every seat’s a good seat. San Diego has perfect, comfortable summer weather and the fair is the 4th largest in the country. It’s always a good time! A large party for the fans has been planned by our friend, LambertLust. Adam’s concert and this party are the must-be places for July! I was at the fair grounds this week and couldn’t help stop my car for this. Banners of all the headliners flank the entrance to the parking lot, and Adam’s is the very first one – catching the eyes of everyone driving by! I guess it’s our exclusive!! OMG! I was hoping Adam would be on American Idol but was losing hope. This is the first I have heard of it but I am thrilled! Very cool if he sings with Angie! You just made my day, thanks! Carol, thanks for the post. Please let us know if you hear of an after-party on the 2nd close to the event. I don’t think I can make it down there on the first. It’s gonna be a fun filled couple of months! I am excited for the IDOL finale. I’ll be watching it for sure. Hope they knock it out of the park. Wish I could go to San Diego. That show would be great. Have fun. Also exciting….Nile tweeted a pic of Adam in the recording studio…apparently he is recording and working on number three….Nile seemed really stoked….Cannot wait for more Adam music…he is amazing. I haven’t been watching Idol at all this season, and not much since season 8. I just wish I would be doing a solo, to showcase HIS voice. God I miss seeing him ! I never really realized that May 8th was Adam Lambert day but I will remember this for sure in the future because this is my moms birthday. My mom passed away 3 weeks ago; I wish I could tell her this because she loved him so much and enjoyed watching him perform. She would have been proud that her birthday was Adam Lambert Day!! I hope some of you watched American Idol yesterday night. 5/9/2013. They anounced that ” ADAM LAMBERT” was one of the most exciting contestants EVER on american Idol. That is correct! Adam is the very best! It really tickled me that they showed him and said that! Wouldnt it be something if Adam was one of the new judges on Idol. I hear all four judges will be replaced. his fans again in USA. Comeon Adam, get with it. Come back to us! I love Adam too. Got to meet him in Pitts. Pa & Cleve., OH on tour. I designed these really hot t-shirts for men & women who are Adam fans. Email me at kittykat7@zoominternet.net. I will send pics , cost and sizes. Get them before they sell out. Limited sizes and quantity. I am so jealous! I would love to go see Adam live again. I love that picture of Adam. He is the whole package, amazing talent, singing, looks and personality! No wonder he is loved by many and the others who don’t love Adam don’t know what they are missing! @adamadamadam – I have 2 extra tickets Floor 5 Row 8 I need to sell at only what I paid for them ($81 each, that was $73 plus $8 Ticketmaster fees). If you are interested you can message me on ALFC (tat2Susan) or on Twitter (SusanSporran). I am hoping to find a fan who wants them.